Urban Mattress Perfect Loft Side Sleeper Pillow Review was recently completed by the MattressJunkie.com team. Urban Mattress is a Colorado based company that started in 2008. Urban Mattress believes that everyone should have a quality mattress and excellent night’s sleep. Customer service is a core value of Urban Mattress and they pride themselves in providing thoughtful service to their customers. Check out what we thought about the Urban Mattress Perfect Loft Side Sleeper Pillow below. What sleep position is best for the Urban Mattress Perfect Loft Side Sleeper Pillow? Urban Mattress Perfect Loft Side Sleeper Pillow is best for side sleepers as the name suggests. 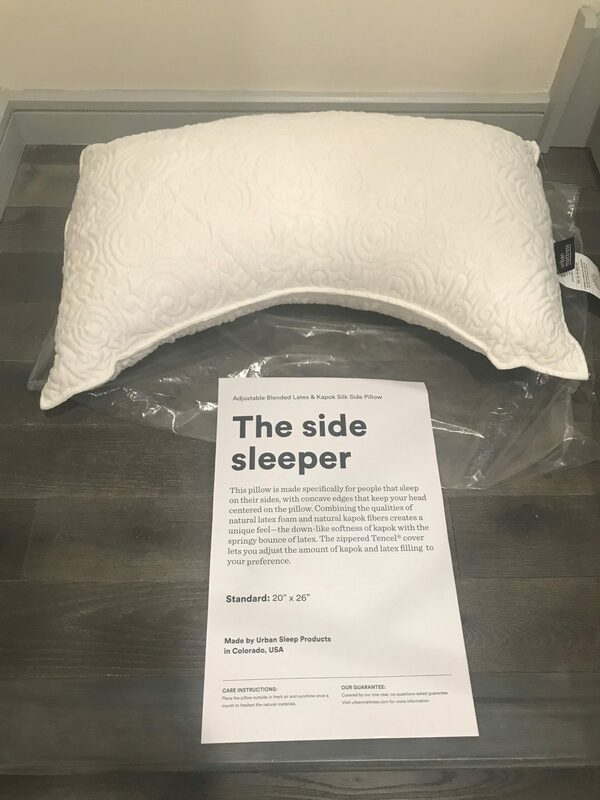 The shape of the side sleeper pillow is perfect for those who put their arm under their pillow when they sleep. As a side sleeper, waking up multiple times per night to adjust your pillow under your head gets annoying. Falling back to sleep after is sometimes impossible. Spine alignment is critical to eliminating neck and back pain. 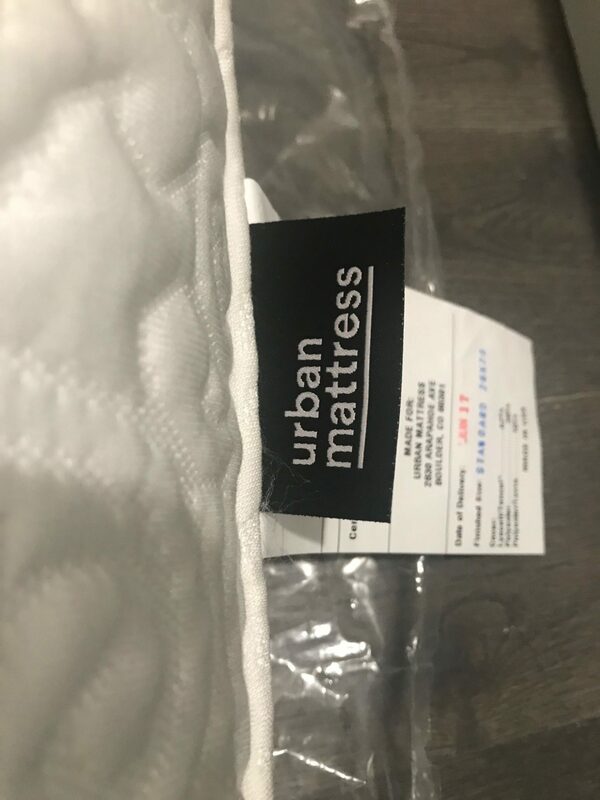 The Urban Mattress Perfect Loft Side Sleeper Pillow does a great job at providing great support throughout the sleep experience. Tell me more about the Urban Mattress Perfect Loft Side Sleeper Pillow cover. 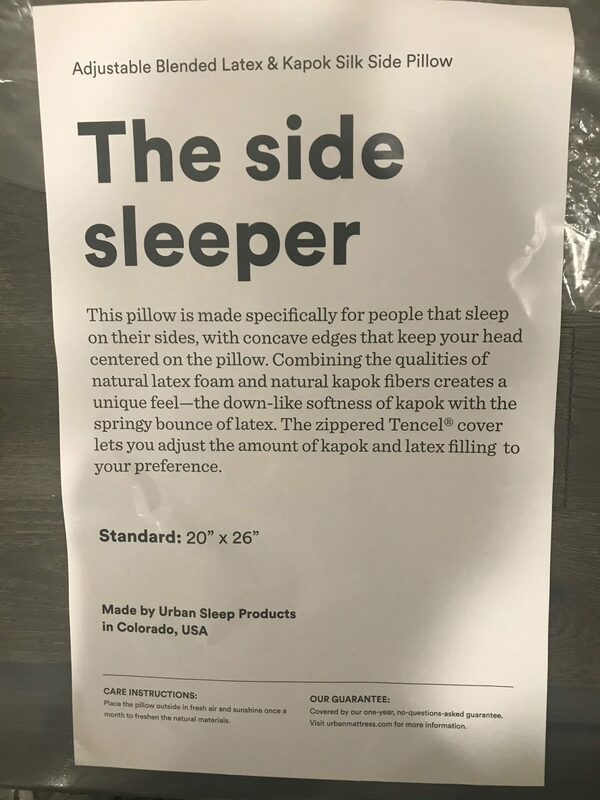 The cover of the Urban Mattress Perfect Loft Side Sleeper Pillow is made from Tencel.. Tencel is a natural fiber made from the pulp of the eucalyptus tree. The cover breathes well and is zippered. You can spot clean the cover with soapy water and a cloth. The natural material in the pillow itself can be refreshed by simply placing outside in the sunshine and fresh air. What’s under the Urban Mattress Perfect Loft Side Sleeper Pillow cover? The pillow core is comprised of shredded natural latex and natural kapok fibers. It can be fluffed up or compressed down according to the sleeper’s preference. The pillow’s consistency has the bounce and spring of latex. With latex, the sleeper will feel like they are sleeping on top of the pillow vs inside the pillow (memory foam is a good example of the sinking in feeling of sleeping inside the pillow). How much does the Urban Mattress Perfect Loft Side Sleeper Pillow cost? Urban Mattress Perfect Loft Side Sleeper Pillow costs $85. What Size is the Urban Mattress Perfect Loft Side Sleeper Pillow? Urban Mattress Perfect Loft Side Sleeper Pillow comes in one size, standard. Does the Urban Mattress Perfect Loft Side Sleeper Pillow have a warranty? Urban Mattress offers a 1 year warranty on their pillows. Would we recommend the Urban Mattress Perfect Loft Side Sleeper Pillow? The Urban Mattress Perfect Loft Side Sleeper Pillow was great to use as a side sleeper. The pillow has a great shape to it and molds nicely to your head and neck without ever being uncomfortable or hot. The pillow is high quality and reasonably priced. Learn more about the Urban Mattress Perfect Loft Side Sleeper Pillow here…..